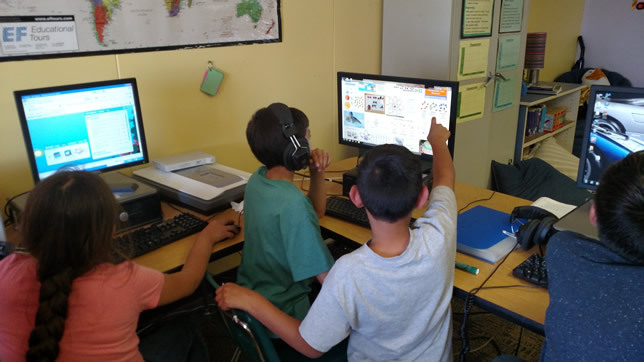 On World Global Collaboration Day September 17, 2015, students with special needs from Finland, Sweden, Germany, South Africa and the United States shared videos with each other introducing themselves and their school. The event kicked off an extended online global collaboration between the students, called the SMARTee Project. The students use SMART Amp technology to collaborate online and teach each other about their local cultural traditions and events. The six special education teachers from around the world first met and formed the idea for the collaboration at SMART Technologies' Exemplary Educators conference last summer. While attending the conference, they found they had more in common with each other than with the general education teachers in attendance. "We were talking about some of the challenges that we have compared to a general education teacher," said Brianna Owens, a special education teacher at Petroglyph Elementary School in Albuquerque, NM. "We do things so differently, but special ed really does look very similar on the global scale, be it South Africa or Germany or Finland, and so we talked about how we could meet some of the challenges by having our kids work together." 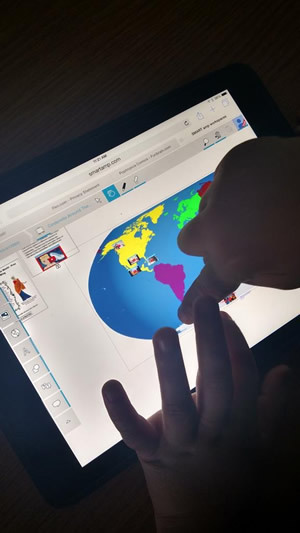 Other teachers around the United States and the world have also discovered the power of online global collaboration projects for students with all types of special needs. 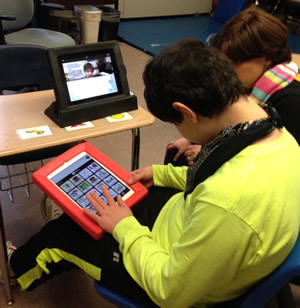 Students who have severe or multiple disabilities, those in inclusive classrooms, and those who struggle with verbal communication and face-to-face socialization are using technology to connect with all types of kids around the world, and are feeling more engaged in the learning process through this inclusive online environment. 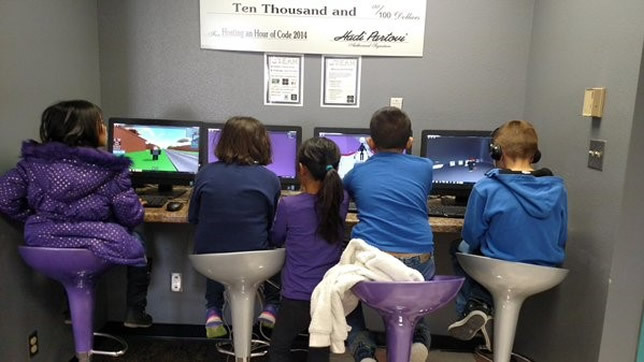 Students in the SMARTee Project are using SMART Amp software to share their work with the other classes, create workspaces for each other to use and collaborate within a shared workspace. Owens' students taught the other classes about the Albuquerque International Balloon Fiesta, an annual event featuring hundreds of hot air and gas balloons. "This is a project I would teach my kids every year, but this year it really took it to that next level because they had to understand it at a level to be able to go back and teach other students," said Owens. Many of the students in Owens' class have learning disabilities or other special needs such as autism that create challenges with communication and socialization, so they often use pictures and other visuals instead of spoken or written language. Owens said those communication differences can create barriers to interaction with the general education students in the school, but they actually facilitated communication with students in non-English-speaking countries because all of the students could understand picture communication, regardless of their language. Owens' quoted Jörgen Holmberg, one of her SMARTee Project colleagues, who said, "Many of the students have problems collaborating with a student sitting next to them or even talking to the kid next to them. That's a huge barrier. But with our kids it's easier for them to collaborate with a kid sitting in another country." Many of the students in Owens' class have learning disabilities or other special needs such as autism that create challenges with communication and socialization, so they often use pictures and other visuals instead of spoken or written language. The goal of the SMARTee project is to help the students "understand their own differences but also understand that our similarities make us more alike than different," said Owens. "My students understand on a daily basis that they're different, and not always in a positive way. This project gives them a chance to understand and embrace those differences and understand that, wow, I might be American and this student is German, but this kid looks like me or writes like me or this kid has the same disability that I have, and so they have that connecting element." Michael Soskil is a science teacher at Wallenpaupack South Elementary School in Newfoundland, PA, and in the two previous years he worked as a curriculum coach for his district, collaborating with special and general education teachers to come up with exceptional learning experiences for the students. Many of those experiences were online global collaboration projects. One of the inclusive classes with both special and general education students participated in a musical exchange project with a group of children in the Kibera slum of Nairobi, Kenya, where about 250,000 people live in extreme poverty in an area approximately 1.5 square miles in size. Soskil's students took a personal interest in the students in Kibera and began a video exchange project, where the Kenyan students would record videos to teach the American students some Swahili, and the American students would record videos to teach the Kenyan students some math concepts. Soskil's students with lower-level math abilities participated by teaching simpler math concepts to the younger Kenyan students. "We know that when kids teach they retain 90 percent of what they learned, rather than when they consume, they only retain 20 percent," said Soskil. "And so for them to create videos on their own to teach was pretty powerful." Through their involvement with the online collaboration projects, Soskil's students became concerned about the living conditions of their friends in Kibera. They learned about the water crisis facing all of Kenya and then organized a campaign in collaboration with students in Kansas and Greece to help get clean drinking water for the Kenyan students. "What we know about learners, whether they're special ed or regular ed, is that in order to transfer information from short term to long term memory, they have to have an emotional connection with what they're learning," said Soskil. "And especially children that have different learning disabilities that are in special ed classrooms, need that emotional connection to really make learning gains. And what global collaboration does, especially when it's on a meaningful topic, where kids are doing good in the world, is it really creates those emotional connections that allow kids to hold onto information." Owens said this year her students had to take their project to the next level because they had to understand the project well enough to be able to go back and teach other students. The Global Virtual Classroom is a source of free online educational resources. Every year it runs a web design contest, where three classes from around the world have to collaborate to develop a site on a common theme while incorporating unique elements from each of the three schools. Janet Barnstable, a retired grade 7 and 8 technology teacher from Percy Julian Middle School in Oak Park, IL, participated in the contest for many years and won first or second prize on numerous occasions. While Barnstable was not a special education teacher, many students with special needs took part in her elective technology class, and she said it helped them feel good about themselves because they could use technology to take advantage of their strengths or overcome their areas of weakness. "For example, those who were good at drawing had Photoshop Elements to be able to express themselves in art. Those who were terrible at spelling could use the text-to-speech features of the Mac," said Barnstable. By collaborating with the students in other countries, Barnstable said those students improved their social skills and gained confidence. Because they were developing a public site, they double-checked their work to make sure things were correct. And because some of the other students weren't native English speakers, Barnstable's students became the language experts and learned to gently correct English errors of their peers. "So they, who had been taught negative things almost all of their life about themselves, were here learning how to speak positively and reinforce other students' skills," she said. At Park Avenue School in Orange, NJ, students with special needs in grades 6 and 7 led a school-wide recycling project after connecting with Community Recycling through Skype. The multiply disabled students learned about what kinds of materials can be recycled and how the recycling process works. They also learned about the organization's Shoebox Recycling program, which collects gently used shoes for shipment to third-world countries. The students decided to contribute by collecting used shoes from the school and community, for which Community Recycling pays the school a small amount of money per pound of shoes collected. To advertise the program to their schoolmates, the students created a rap video and performed a skit. They placed shoe collection boxes throughout the school, and it's their responsibility to track the number of shoes they collect, the condition of the shoes, how much they weigh and how much money they receive as a result. "It gives them some degree of responsibility, and so we thought it would be good, and they seem to enjoy it," said Robert Coles, the special education teacher who leads the project. The students have also become the liaisons for the school's recycling program and are responsible for weekly monitoring of the recycling bins in each classroom. It's their job to ensure that only recyclables are placed in the bins, and they notify the teachers if the bin in their classroom contains nonrecyclables. "It builds responsibility; it builds teamwork; and it builds a sense of pride in each of the students," said Coles. "They have these shirts that they're wearing, which lets the school know that they're part of that recycling team, and I think that that pays great dividends for each of the students as individuals in terms of building their self esteem." Sharon Alterman teaches middle school-aged students with severe and multiple disabilities at the Charms Collaborative, a special school for students with low-incidence disabilities in Stoughton, MA. Her students have significant intellectual impairments combined with physical impairments, neurological impairments or visual impairments. Alterman has non-verbal students who use augmentative and alternative communication (AAC) as their primary means of communication. "AAC is a very slow means of communication, even for fluent communicators; it's still much slower than spoken communication. And people won't necessarily wait," she said. The iPad AAC app her students use, called Proloquo2Go, interfaces directly with Twitter. Alterman has found that by involving her students in online global collaboration projects through Twitter and other online tools, "they can communicate using their primary means of communication and not have any barriers. Everyone's communicating the same way. Unless somebody says that they're communicating with AAC, nobody would know, nobody has to know, and that's extremely powerful." Last year, Alterman and her students started using Twitter and other online tools to participate in several global collaboration projects, including the Summer Math Photo Challenge, where students post photos to illustrate weekly math concepts; the Global Read Aloud, where students around the world read the same book and connect online; the Not Perfect Hat Club Global Blogging Challenge, where students read The Not Perfect Hat Club and blog about the book; and the Global Math Task Twitter Challenge, where students complete math tasks and post their results. Alterman said her students loved making peer connections through the online collaborations and were very motivated to participate. "We hear a lot in special ed about, 'You should walk into the classroom and not be able to tell the special education students from the typical students.' Well, I'm sorry; you see my students, and you're always going to be able to tell because it's the way they present and the way they communicate. You're always going to know, but this is the one universe in which nobody has to know, and that's extremely powerful."